A number of historians of the idea of progress trace the notion to the mystic Joachim of Floris (1131-1202). Karl Löwith, in his classic Meaning in History (1949), believed that Joachim had delineated a “new scheme of epochs and dispensations by which the traditional scheme of religious progress from Old to the New Testament became extended and superseded.” This new scheme is found in his work that came to be called the “Eternal Gospel,” which outlined three stages in history, the Age of the Father, Age of the Son, and Age of the Holy Spirit, corresponding with the Old Testament, New Testament, and an impending apocalyptic event, or eschaton. Robert Nisbet, in his History of the Idea of Progress (1994), also saw in Joachim and his followers, the Joachimites, a combination of “belief in the necessity of a period of catastrophic violence to usher in the golden age on earth with a philosophy of cumulative, stage-by-stage progress from the past to the future.” Both Nisbet and Löwith explain how Joachim’s vision of history had unintended consequences, when Saint-Simon, Comte, and other positivists appropriated his vision for their own purposes. Joachim had rejected the Church of his day as corrupt. His followers, the Spiritual Franciscans, or Fraticelli, also decried the corruptions of the Church. I mention Joachim because about midway through his Intellectual Development of Europe (1863), Draper praised his “Everlasting Gospel.” He observed that “notwithstanding its heresy, the work displayed an enlarged and mastery conception of the history of progress of humanity.” Earlier in his book, Draper had also concurred with the Fraticelli when they claimed that the “fatal gift of a Christian emperor had been the doom of true religion.” According to Draper, the Spiritual Franciscans were reformers, and those generations who had survived the fires of the Inquisition became followers of Martin Luther. The other day I began reading the introduction to Anthony Grafton’s Worlds Made by Words: Scholarship and Community in the Modern West (2009). This work is a collection of essays, originally published between 1983 and 2008, on the nature of scholarship. Grafton covers a wide-ranging set of topics, from The Republic of Letters to Google’s digitizing empire and the future of reading. Amidst such topics are concise, but erudite, discussions on Francis Bacon, Johannes Kepler, Isaac Casaubon, Mark Pattison, Leon Battista Alberti, Johannes Trithemius, Tommaso Campanella, his own postgraduate supervisor Arnaldo Momigliano, and the Warburg Institute of the University of London. Grafton also discusses John O’Malley and his work on the Jesuits, in addition to the relationship between Christian and Jewish learning in the seventeenth and eighteenth centuries. Another element in James’ scholarship was his emphasis on the historical continuity between ancient Christianity and the contemporary English church. According to Nelles, this view goes as far back as John Foxe’s (1517-1587) Book of Martyrs (1563), where he allegedly “documents the trials and tribulations of the ‘true church’ which had survived underground and invisible through centuries of papal corruptions and outright persecution.” James contributed to this tradition with his Apologie for John Wickliffe (1608). According to this view, attempts by the Bishop of Rome to control and corrupt Christian religion had been adroitly seen off within the early church: the church of the Fathers had not been subject to papal jurisdiction and at times could be seen to have been aggressively anti-Roman. Yet through deceit and treachery the pope had usurped Christ’s rightful place at the centre of the church over the course of the middle ages. The pope (now Antichrist) used all means possible to increase his power: he withheld the true teachings of Scripture; he appealed to popular superstition through liturgical hocus-pocus and abuse of the sacraments; and he invented traditions founded neither in Scripture nor the writings of the Fathers. From this perspective it was at the Council of Trent that the views of the popish minority came to dominate the church as a whole. Thus, while early Protestants had merely broken with Rome, the contemporary reformed church was engaged in a pitched battle with a united Roman Catholic church supported by foreign Catholic princes and receiving instructions directly from the pope. James never finished this project, the financial support drying up by 1612. Nelles turns to James’ program as Bodleian librarian. Interestingly enough, although he remorselessly attacked Catholic scholars, it is clear that James appropriated much of their findings. “On most technical issues of scholarship,” writes Nelles, “James and his Catholic opponents in fact had much in common.” This engagement with the Catholic world of scholarship is found in a large number of Bodleian indices of “prohibited and expurgated books published by Catholic authorities in Spain, Portugal, Italy, France, and Germany.” But as Nelles is careful to mention, “Bodleian was by no means exceptional in the orientation of its holdings. 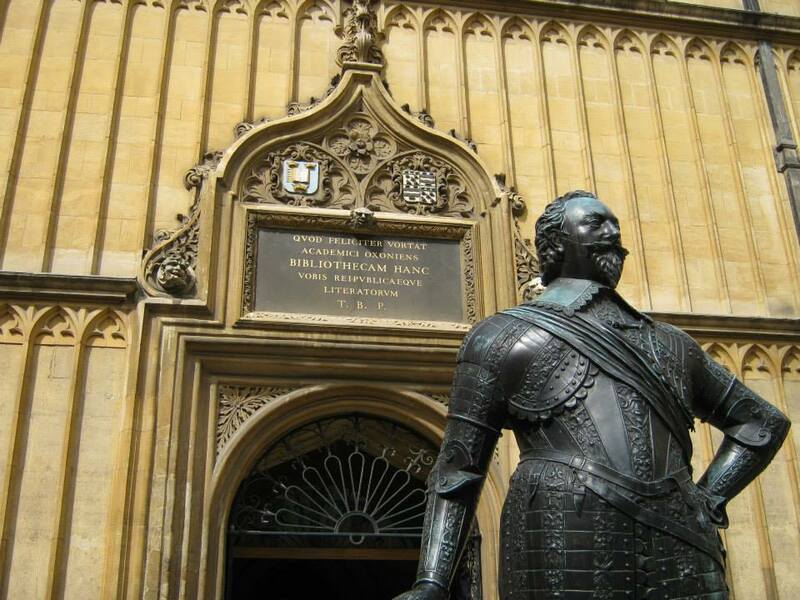 On the contrary, the amassing of an abundance of Catholic scholarship in the Bodleian in its first decades reflected activities” in other libraries in Britain. Opposition to “popery” was of course not a new feature of life in nineteenth-century Europe. Fear of Catholicism extends as far back as Protestantism itself. A number of historical events in the nineteenth century, however, increased the intensity of anti-Catholic sentiment. The passing of the 1829 Catholic Emancipation Act; the Anglo-Catholic Oxford Movement in the 1830s, led by John Keble, John Henry Newman, and Edward Bouverie Pusey; Newman’s Tract XC in 1841 and later his conversion to Catholicism in 1845; the “no Popery” movement of 1850-51; Irish immigration; the notorious pastoral letter, “Flaminian Gate,” from Archbishop of Westminster Cardinal Nicholas Wisemen; and a lecture entitled “The Decline of Protestantism, by John Hughes, Catholic Archbishop of New York, all played a role in increasing hostilities between Protestants and Catholics. 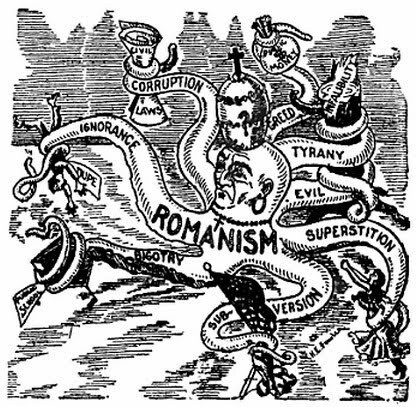 Anti-Catholicism was undoubtedly a significant feature of the Victorian period. It was manifested in sermons, petitions, tracts, pamphlets, newspapers, and magazines. But as other recent scholarship has demonstrated, it was decisively through fiction that anti-Catholicism was largely disseminated. 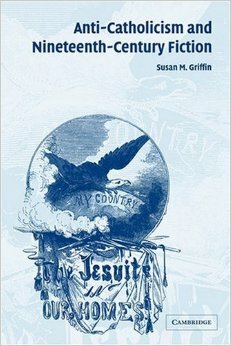 Susan Griffin’s Anti-Catholicism and Nineteenth-Century Fiction (2004) and Diana Peschier’s Nineteenth-Century Anti-Catholicism Discourses (2005) persuasively argue that the Victorian novel dramatized the supposed evils of Catholicism. As Griffin argues, the Protestant obsession with Rome was “distilled to provide Victorians with a set of political, cultural, and literary tropes through which they defined themselves as Protestant and therefore normative.” From Sarah Josepha Hale, Charlotte Bronte, Benjamin Disraeli, Henry James, Frances Trollope, and Charles Kingsley, Victorian fiction provided plots, characters, and imagery for an anti-Catholic imagination.